Beginning in 1982, the Chinese Gold Panda coin program has released the official silver and gold bullion coins of the People’s Republic of China. All official gold Chinese Panda coins contain .999 fine gold bullion. Official Chinese gold bullion coins were originally available in weights of 1, 0.5, 0.25, and 0.1 troy ounce. In 1983 the Chinese Mint also added a smaller 0.05 troy ounce gold coin and later phased in 12 & 5 ounce coins over time. In 2016 the Chinese Mint began striking updated sizes of the Chinese gold Panda coin series using weights in grams (rather than troy ounces) to better match the nation’s standard metric system. The Chinese Mint’s now 6 bullion coin product line includes 5 gold Panda coins (1, 3, 8, 15, and 30 grams) and 1 silver Panda bullion coin (weighing 30 grams). 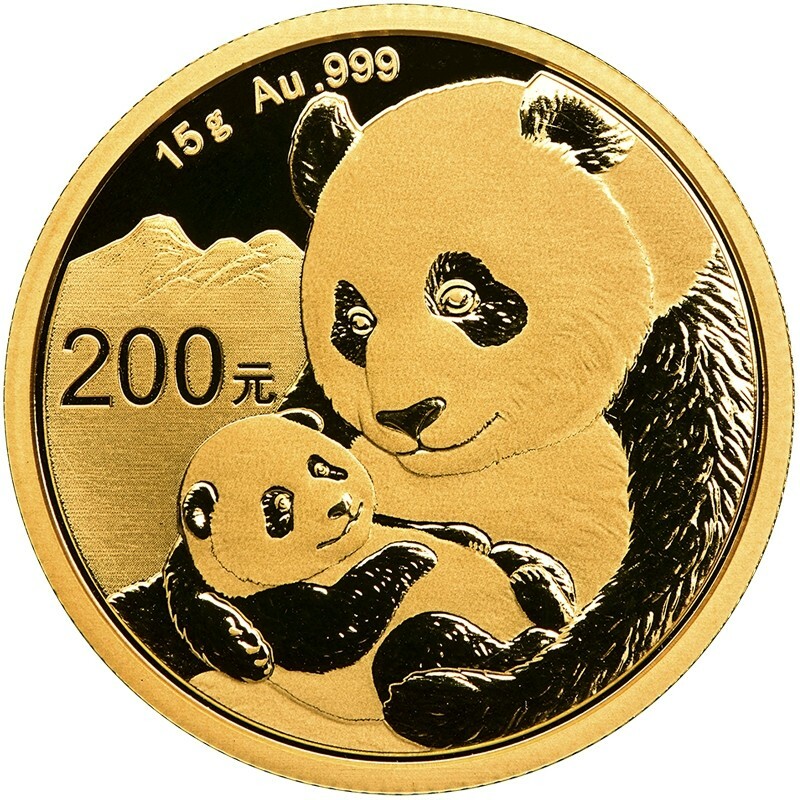 This 15 gram Chinese Panda gold bullion coin is in high demand by both bullion and coin collectors as it generally yields very high bid and ask premiums all over the world in relation to the fluctuating spot prices of gold. Contains 15 grams or 0.482261 troy ounces of .999 fine gold bullion. It carries a legal tender face value of ¥200 (Yuan). Held in an original People's Bank of China sealed plastic covering. Eligible for inclusion in your Gold IRA. The front of this coin has a brand new panda design for 2019. This coin’s legal tender face value, gram weight, precious metal content, and .999 fine purity are also engraved on its front side. 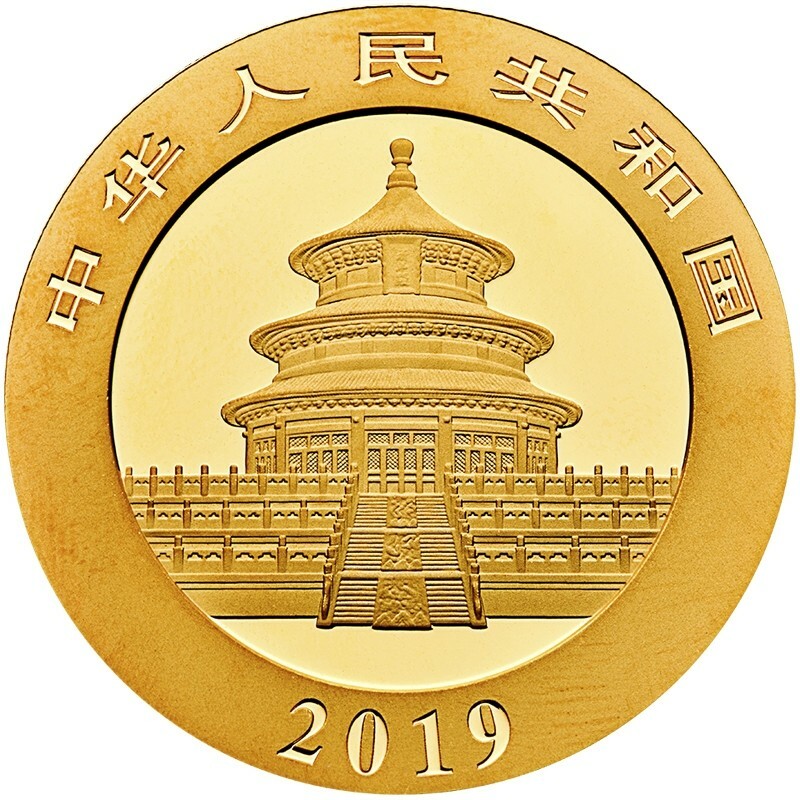 The back of this coin is stamped with Beijing’s Temple of Heaven, the ”People's Republic of China" written in Chinese characters, and the 2019 year of strike and issuance. This coin’s weight and purity are guaranteed by the People's Bank of China. The artwork on the coin’s front side changes annually while the coin’s backside temple image has remained the same since the Chinese Mint began issuing official bullion coins in 1982. This official China gold bullion Panda coin is a hot commodity amongst physical gold bullion investors given its declared low maximum mintage and the robust premium track record gold Panda coins have historically achieved. Great Prices on Brand-New 2019 Gold Pandas!